Client terminal allows to prepare requests and request the broker for execution of trading operations. Moreover, terminal allows to control and manage open positions. 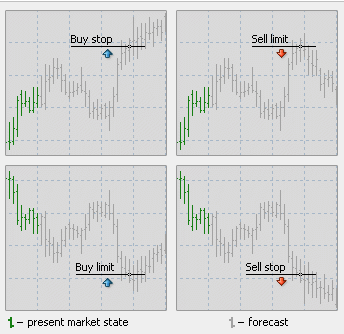 For these purposes, several types of trading orders are used. Order is a client's commitment to brokerage company to perform a trade operation. The following orders are used in the terminal: Market order, Pending order, Stop Loss and Take Profit. Market order is a commitment to the brokerage company to buy or sell a security at the current price. Execution of this order results in opening of a trade position. Securities are bought at ASK price and sold at BID price. Stop Loss and Take Profit orders (described below) can be attached to a market order. Execution mode of market orders depends on security traded. Orders of Stop Loss and Take Profit can be attached to a pending order. After a pending order has triggered, its Stop Loss and Take Profit levels will be attached to the open position automatically. Stop LossThis order is used for minimizing of losses if the security price has started to move in an unprofitable direction. If the security price reaches this level, the position will be closed automatically. Such orders are always connected to an open position or a pending order. The brokerage company can place them only together with a market or a pending order. Terminal checks long positions with BID price for meeting of this order provisions (the order is always set below the current BID price), and it does with ASK price for short positions (the order is always set above the current ASK price).To automate Stop Loss order following the price, one can use Trailing Stop. Take ProfitTake Profit order is intended for gaining the profit when the security price has reached a certain level. Execution of this order results in closing of the position. It is always connected to an open position or a pending order. The order can be requested only together with a market or a pending order. Terminal checks long positions with BID price for meeting of this order provisions (the order is always set above the current BID price), and it does with ASK price for short positions (the order is always set below the current ASK price). history charts are drawn only for BID prices in the terminal. At that, a part of orders shown in charts is drawn for ASK prices. To enable displaying of the latest bar ASK price, one has to flag the "Show Ask line" in the terminal settings.